Thanks. The strip name probably has nothing to do with SY then. The Brass Sun story "Motor Head" has got to be named after the legendary band though, at least. I've a vague memory of that song from the first time round. Don't think I've heard it since. I love it. I'm going to listen to it now as I clean my boat. The most interesting thing my rabbit hole dive turned up was that the US release of the film ends on that scene and the triumphant note it strikes. The UK version ends with the main character leaving the stage to find the band have broken up, her relationship's over, and her management have conned her into selling out. She suffers a nervous breakdown on the tube and ends the film drooling in a sanitorium! Two cultures, divided by more than our common language. Eh, there are plenty of great US movies that end on a down note. And I don't feel we're particularly divided, as far as cultures go. But every culture has differences. Plus you're talking about a movie edit from 1980. These days if a downbeat drama gets distributed from overseas, they're a lot less likely to tack on a happy ending. Along with a lot of other reasons why I find that kind of "us vs them" generalizing mentality to not really apply much. And yet, aside from the band, the only other famous Motor Head seems to be a fella from Frank Zappa's band. 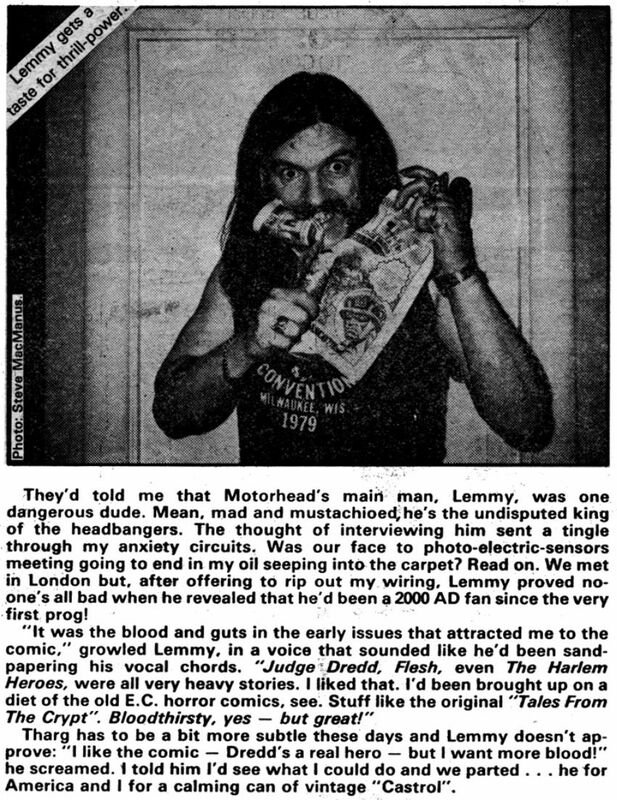 Originally Motorhead was a song written by Lemmy while he was in Hawkwind (the subject of which is speed). One of my favourites - gotta love a song that manages to rhyme "parallelogram"! For sure, I enjoyed two Lemmy books over the last year or so, his autobiography and the later biography called Lemmy. I think his band is legendary enough that it'd be quite tough to name something that without it being a nod. 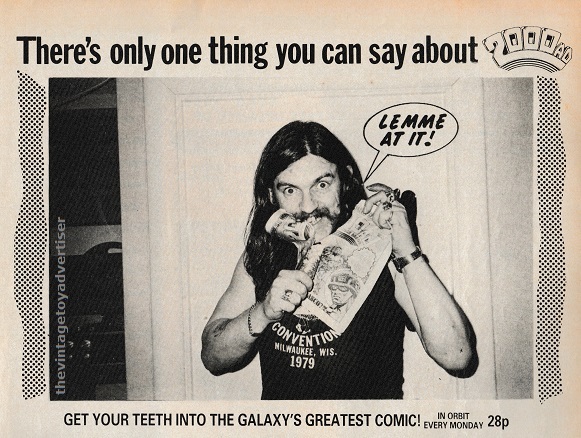 Plus Lemmy has even been featured in 2000AD. I seem to recall a photo of him eating a prog. Did he do anything based on Nurse Gladys Emmanuel I wonder?